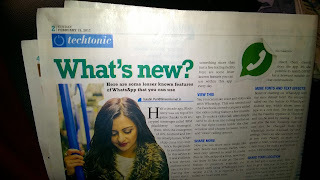 So is it a mere coincidence or is there something strong brewing, behind so much coverage being given by the most popular Print Media to news relating to this Virtual all -pervading bit of an App which is less of a messaging platform as it appears now, and more of a powerful Social and Business networking innovation of the modern day ! As if the acquisition by Facebook was not enough to announce its prowess , this one news report above about a talented sportsperson feeling left out because of his exclusion by his colleagues in a Whatsappp group leaves me completely baffled , at how quickly the virtues and vices of the human instincts have been flawlessly captured by this piece of technology ! It’s indeed a true reflection and the quickest one at that – the quintessential portrait of all that we stand for today – the good, the bad and the ugly , too ! I shall admit it that I am no brains when it comes to Sports happenings and in all probability, I would never have bothered to even peep into the sports section of the daily , however the bold lines beginning with “Whatsapp exclusion…”, at first made me wonder whether mistakenly or as a new feature the editorial section has shifted to some other pages , after all how could something seemingly a comment on maybe a technology or social app figure elsewhere…, but as I looked carefully, it was not an article but a news report that too a verbatim from a famous sportsman of the most celebrated game of Cricket !And then there's another one educating about it's new features in the Technology Section ! I wonder, since when has the exclusion or for that matter inclusion , from / in a Whatsapp group started impacting sports persons and the likes to the extent of irking them or pleasing them… ? And that has pretty much been the end of my Sunday and the beginning of a chain of thoughts and insights as to where all this is leading to…and where all this is coming from ! I remember when not too far in the distant past ..maybe only a year or two back ..whatsapp was seen as the trivial pastime for the idle ones, and the serious ones have taken their own time to embrace it …. Not intending to now dwell into educating my readers about what all this platform is capable of doing, in terms of messaging ; communication, caring and sharing; since all of you must already be advanced level users , I shall still confess and admit to steer clear my own conscience that yes, I myself am a part of not less that 25 whatsapp groups , yes I am and though not the enviable admin yet, but a spectator and participant to the happenings, definitely I am and that’s 24 by 7 ! Every small or big project that I take up nowadays, starts with a Whatsapp group to initiate updates and discussions ! Most often, my days begin with some lovely exchange with like mindeds in these groups and entire day I need to ensure the batteries of the smartphone are charged enough ! There are better and worse applications and implications., and much more going on…we know and let’s keep that for later ! A clear advantage that Whatsapp has over others is without a doubt the fact that it started with, being a phone messaging app and has ever since remained as close to us as our inseparable mobile phones ! Infact there are very interesting Status Display Messages on many people’s phone numbers ,further reinforcing it being the preferred mode of communication for many, like “Hey there ! I am using Whatsapp”.. and the other one where they mention, “Can’t talk , Whatsapp only “ ! We can still heave a sigh of relief by acknowledging that all of it is still largely voluntary and not forced , that we can still keep ourselves excluded from groups we don’t want to be seen in , and make the best of where we wish to be appreciated, - we can indeed, atleast till it doesn’t figure in any “Inclusion” agenda of the responsible law of the land ! However, the piece of news above surprisingly from the sports arena this time, is a clear picture of what levels its influence stands today ! The very fact that it’s not a part of the black and white in deeds and contracts of organisations and businesses at one instance makes us believe it’s not after all a mandatory compliance, but with no clear rules of its usage, this may turn out to be just a false consolation, in fact this leaves enough room for the subtle and indirect albeit more deadly instances of one controlling the other ,or as they say another level of trolling and bullying , not to miss out the more evident happenings of privacy invasion and security compromise etc..
We are all human, and essentially that’s the reason our Apps too are getting more and more human..Does that really work in our favour ! However frivolous it may be to be a part of a whatsapp group and to keep tickling the funny bone making fun and laughing at the creative forwards, it may turn out to be a serious let down if you are not a part of one ! And is it really a choice any more .. ? “To be or Not to Be “…, is the interesting question for many ! #Remembering Galileo Galilei on his Birthday !